In November 1943, four years into World War II, Corporal Sid Wade, a conscripted and reluctant soldier in the British Army, was uprooted from a cold English winter and transported to the tropical coast of West Africa. Sid Wade was the author’s father and, nearly 70 years after his two-year stint in Sierra Leone, he discovered the scrapbooks and diaries he had compiled during his time there. These were filled and overflowing with letters to and from home, his army paybook, post cards, snapshots, drawings, paintings, newspaper clippings, maps, government pamphlets, amateur dramatics and music concert programmes, poetry written by army buddies and newsletters written by the soldiers. These scrapbooks and diaries told more than his father had ever spoken about – they told a story that had little to do with the big picture of the war, but rather the smaller picture of day-to-day life for young soldiers suddenly transplanted into an alien and often frightening environment. Battling a harsh climate and tropical diseases as they trained members of the Royal West African Frontier Force, the soldiers found time to write and produce newsletters, paint and draw pictures, write poetry, put on music concerts and even organise amateur dramatics productions, all in a region that was something of a forgotten front, and known to all as The White Man’s Grave. Thanks to these scrapbooks and the associated ephemera, plus the author’s own research, at least some part of Corporal Wade’s African experiences, and that of his fellow soldiers, has been uncovered, shedding light on a less well-known aspect of WWII. 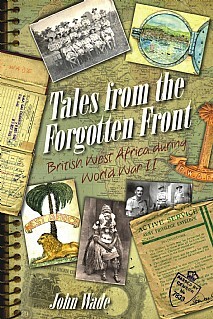 This engaging and revealing book presents an unusual perspective on British soldiers’ lives in West Africa and will be of especial interest to anyone interested in recent military history, particularly WWII, and the African people’s culture and lives at the time.